I have very fond memories of my early years with the LGBRC and of course Cat’s Hill. It’s certainly seen it’s fair share of accomplished competitors and it’s always been pretty entertaining. I joined the LGBRC in late 1973 because I wanted to ride with Bob Tetzlaff. I was 15 years old and was fortunate to be able to ride under his guidance for those first years. 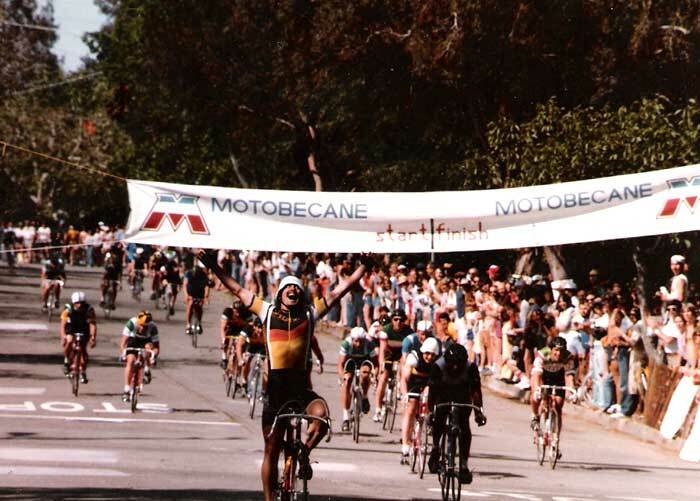 The first races I participated in were Los Gatos club events. Some of the fundamentals he taught back then I still use today. In 1974 the LGBRC put on it’s annual races which then were the Hollister Road Race on Saturday and the Corrolitos Road Race on Sunday. My first win came in Corrolitos, as a Junior, that year which was then a 50 mile race Before 1975 almost all bicycle races were held on the open roads and as the field size increased so did traffic problems and by 1975 open road races were essentially banned. That is what mostly that made criteriums so popular to put on. So in early 1975 the club started searching Los Gatos for a suitable location for a crit. When it comes right down to it, it’s not easy finding a suitable crit location in Los Gatos, at least downtown. I started looking around the Bachman Park area and doing so started to think about going down Cat’s Hill or Nicholson then left onto Massol and then left up Bachman. Thankfully Bob immediately saw the attraction of going up Nicholson and around the Park. And with that we had a course. It’s always been a tricky course in that the whole circuit has some serious cracks and seams running up and down the pavement. Ready to rip the tire off of your rim. I was initially a little bummed with the course because I knew being a sprinter type, it wasn’t really my type of course. However, time would tell that I was actually very competitive there. Maybe because of the home town advantage thing! Late September 1975 was the first year Cats Hill was held and the SR 1-2 race was won by Paul Wilson in a photo finish from Craig Elliot. I had high hopes to win the Junior race but finished third behind winner Chris Springer who was the Intermediate National Champion in both road and the track and Chris Hill. I have little recollection of the race itself, but I remember being disappointed with third. In the 1976 Cat’s Hill race I was now a first year SR 1 (SR 1 later became Cat. 1). 1976 was a good year for me as I made the USA National A track team and went to the Montreal Olympics. On the day of Cat’s Hill I flew in from Trexlertown, PA where I had just concluded a season long series which ended the night before. I was able to make the Saturday Cat’s Hill race, but I had no legs that day and dropped out unceremoniously at about the halfway point. I don’t remember much from that race either, but I do remember being extremely uncomfortable. And yes, flying whacks your legs. The 1977 Cat’s Hill raced was moved to May instead of September. I was a little more prepared for this race than in 1976. 1977 is the year I dropped my chain on Nicholson (Cat’s Hill) and was able to keep going. This is what happened. My race strategy at Cat’s Hill was to try and make the climb as easy as possible. I would do this by being one of the first few racers as we turned to go up the hill. By the time we hit the top of Belmont I would be mid field and would then pass most everybody by the bottom of the hill in time to do it again. So on this particular lap I turned onto Cat’s Hill started up and then bang. 1n 1977 we still had down tube shifters ( there are people who probably don’t even know what those are) and I probably made a bad shift and the chain fell to the inside of the chain rings. The second it popped out of gear I turned hard left hoping nobody was there and made a u turn and started down the hill passing racers still coming up. That was thrilling! I hit the bottom and it took me several seconds to get the chain back on. By the time I started up the hill again the tail rider was just going over the top. I chased like mad and caught the tail enders at the bottom of the hill and then rejoined the leaders a lap later. A lap later I won the mid race prime which was a trip to Hawaii. This left me a little whacked for a few laps and I was just riding it out hoping for a field sprint, which it was starting to look like it might be. Unfortunately for me Marc Brandt, a Junior racer no less pulled a fast one and got away with a dozen laps to go. I don’t think anybody thought he would make it stick, but he did and took the win solo a few seconds up on the field. I learned another important lesson that day about Cat’s Hill. It’s hard to make a pass after you turn from Bachman unto Tait. In my case I got beat to the line by Mark Van Pringle by inches. A complete non sprinter held me off. Live and learn and I did. Because of other racing obligations I missed Cat’s Hill in 1978,79,80 and 81. In 1982 I was back racing for Specialized with their first road racing team. However, this was the year that the Hill bite back and I crashed hard just as I was turning to go up Cat’s Hill. Bent the bike and bloodied my nose. Up until then I felt good and thought I had a good chance to win. I would settle that score. 1983 was the race I was looking for at Cat‘s Hill. I was desperate to win a race since I was so far winless on the road that year. And I was in good shape also. So the race starts, it gets hard, the field shatters, it’s really hot, I briefly think about dropping out. The main lead group is now only about 15 guys. The whole race I have been doing my thing, getting up front before the climb and trying not to lose to many places by the top. But as the last couple of laps play out the pace is way high. Gerhard Schonbacher a former multiple TDF Lantern Rouge winner (or is it loser?) was driving the pack at a murderous pace. Within two laps to go I maintained good position over the top of Belmont and then made a good move down Bachman which put me into about third as we turned onto Tait with now just one more lap to go. Try as I might I lost position after position up the hill and by the time we got to the top of Belmont for the last time, I was the last guy. At least last guy in the lead group. There were still about 12 of us. I remember how much I was hurting right about then. You don’t know much about me but I was a match sprinter at one time. At one point I was a pure sprinter. Which means climbing isn’t really in my nature and I sure as heck don’t climb like some of these other guys seem to! But sorry, I digress. I’m at the top of the hill in last place and I feel like sh*t and I look over to my right and my older brother is at the top of the hill in Bachman Park looking at me and I knew what he was thinking which was “what the *@ck are you doing back there?” That was all it took. I looked back and now we were turning onto Bachman and starting downhill. Single file and accelerating. I had let a gap open at the top and as we entered the steepest section on Bachman around Glen Ridge I started my sprint. Then to my utter astonishment the lead racer swung off and nobody pulled through. At that point I was at full speed heading for Tait on the inside which at my current speed and position, I was not going to make the turn. The pack started sprinting and there was a giant drag race for the final corner. I made it first, passed the lead rider just before the turn and was able to make a quick turn left to give myself room to make the hard right. As I railed the corner I knew I would win because it’s virtually impossible to make a pass from Tait to the finish line. What a beautiful feeling it was to finally win my home town race on a course that was never especially suited to my style of riding. I missed 1984, but was back again in good shape for the 1985 event. What a race. I had a good shot at winning this one were it not for Gavin Gilchott and Dave MacLaughlin Dave Mac made a move off the front following a prime at about the halfway point. He managed to stay away until the end. However with under ten laps to go the pace picked up and we tried to catch Dave, I think I even took a pull! Anyway, with about 3 laps to go Gavin broke loose and caught Dave who was now only several seconds ahead of us. I thought we would catch them, but they managed to stay away. I won the wild field sprint for third place by out dragging the field into the final turn at Tait. In 1986 I finished fifth in what was I think the fastest pace ever for me there. The race winner was Mark Caldwell. The pace was pushed by Gavin Cilchott who had just competed in the Paris Roubaix, or something like that and he was eager to show us how strong he was . And he was! But somehow Mark must have got by for the win. I should know I was there but I didn‘t see it. In effect it was a sprint finish except we were strung out nose to tail the whole time. Starting the last lap I was in fifth place and at the finish line I was still in fifth place. I missed 1987 but was back for 1988. I was recovering from one of the worst cycling crashes of my career which occurred in late ‘87. It partially herniated two lower discs and by May of 1988 I was racing again, but my back was still weak. I lasted about halfway before packing it in. That was after finally hitting one of those infamous seams in the road which flatted my front tire and very nearly crashed myself. It wouldn’t be until 1995 that I would be back racing Cat’s Hill. Even though I was 38 years old at the time I still raced the Pro/Cat1 races, but now and again I would race a good Masters event. In 1995 Cat’s Hill held it’s first ever Master event. I had a good day winning the King of the Hill award and then with only a few laps to go took off solo, caught Larry Nolan who had been off the front, got away from him and won solo. And that is how my experience ended at Cat’s Hill and you know, I could live with that.